WASHINGTON COUNTY — Three separate crashes involving serious injuries over the past two weekends near Warner Valley led to three coinciding rescue efforts and a reminder from officials regarding area conditions and off-road vehicle safety. 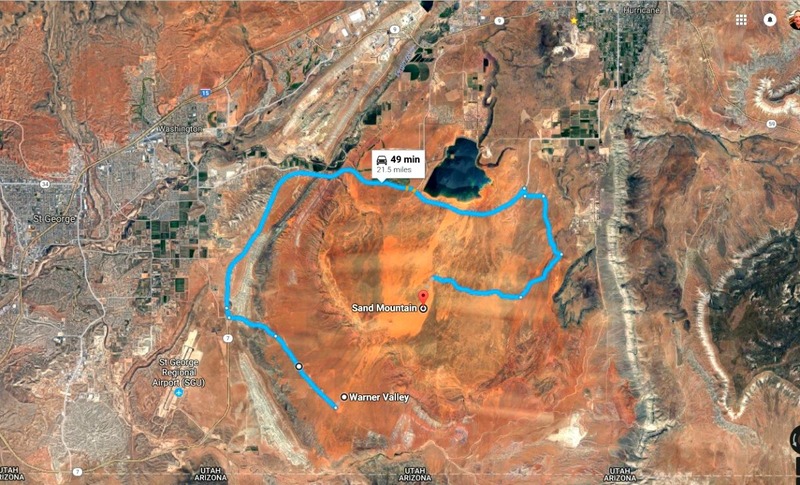 The first incident occurred March 17 and involved a 33-year-old man who was injured while riding his dirt bike on the southwest side of Sand Mountain, Cashin said. Shortly after 11 a.m. emergency personnel were dispatched to a motorcycle crash just a few miles from Warner Valley. The man was riding on a single track down the back side of Sand Mountain, Cashin said, and was thrown from the bike when he crashed. The rider landed on the ground in a sitting position and then was struck on the back by his motorcycle as it landed on top of him. Rescuers hiked to the top of Sand Mountain and made their way down the southwest slope of the mountain before reaching the injured rider. The man was loaded into a litter and carried to the top where a medical RZR ATV drove the man to awaiting ambulance, and within minutes he was transported to Dixie Regional Medical Center for evaluation and treatment. The second rescue occurred Friday and involved a 17-year-old riding his motorcycle in the same area of Sand Mountain when he crashed. During impact the bike’s handlebars struck the teen in his abdomen with a force that caused extensive internal damage and injury, Cashin said. More than 20 search and rescue personnel were called out, in addition to numerous responders from multiple agencies, Cashin said, and the team once again hiked to where the injured teen was located. 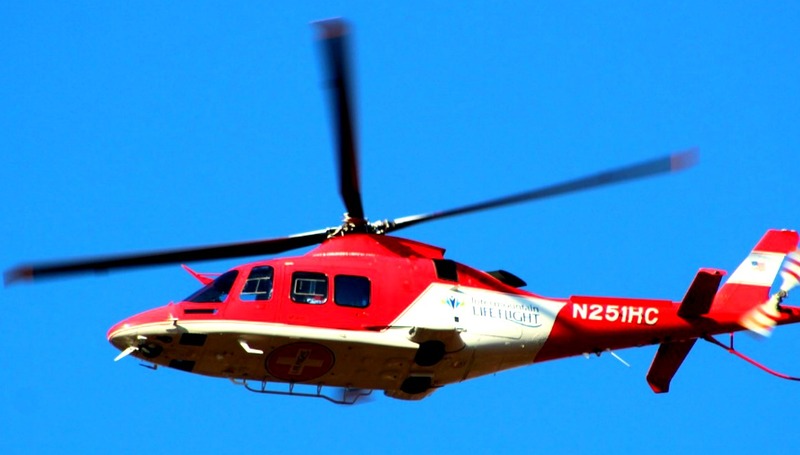 The medical team assessed the teen’s injuries, and once he was stabilized for transport he was flown to Dixie Regional Medical Center by Intermountain Life Flight, Cashin said. “The rider underwent emergency surgery at Dixie Regional that day and is still in the hospital recovering,” Cashin said. On Saturday evening rescuers were dispatched to a reported crash that involved a 56-year-old woman riding an ATV on one of the slopes of Sand Mountain, a few miles east of where the previous crashes occurred. The woman was thrown over the handlebars before landing on the ground, Cashin said, possibly injuring her neck. The woman reported pain in her head and back when rescuers arrived, and she was stabilized at the scene before being carried to a waiting ATV. Shortly after reaching the staging area she was flown to Dixie Regional Medical Center by Life Flight. “As a general rule anytime someone reports pain or injury to the neck, back or head, they are flown to the hospital as a precaution,” Cashin said. The deputy said there were similarities in all three rescues. The first was an isolated location that is difficult to reach and has little or no cellphone service. In one of the rescues, it was a passerby who witnessed the crash and then hiked to the top of Sand Mountain to get a signal and call 911. In the other two rescues, someone in the injured person’s party called 911, but they also had to hike away from the scene before they were able to call for help. The deputy also said that Sand Mountain rescues typically require more than one rescue team. Additional emergency personnel are typically called out when rescuers are dealing with steep terrain, or locations that are only accessible on foot. In order to reach the injured party, first they park the medical ATV at the top of the mountain and then hike to where the rider is located. The team then loads and carries them back up to the top to be ground transported to a waiting ambulance or helicopter. Each incident required a significant number of responders from multiple agencies, Cashin said. More than 25 were called out for each incident. Being prepared will help any rider who may face the unexpected, Cashin said, and can even make the difference between making it out of a situation in good shape or not making it out at all. Always wear the appropriate safety gear. At a minimum, this should include a helmet, shatter resistant eye protection, long sleeves, long pants, gloves and boots that cover the ankle. Only carry passengers if the OHV is specifically designed to do so. ATVs and off-road motorcycles are designed to be ridden by only one rider, and carrying passengers can alter the balance of the machine, causing a loss of control. Be prepared for any emergency. Always carry a tool kit and spare parts, a first aid kit and survival equipment when you ride. Carry plenty of extra food, water and fuel. Check the weather forecast before leaving home. For winter riders, always check the avalanche forecast before venturing into the back country. Avalanche information is available from the Avalanche Forecast Center at 801-364-1581. Never drink and ride. Alcohol and OHVs don’t mix but create a deadly and illegal combination. Riders under the age of 16 should be supervised by a responsible adult at all times. Riders should be able to straddle the machine with a slight bend to the knees while both feet are on the footrests; a machine that is too big is a major cause of injuries to young riders. The Washington County Sheriff’s Office, Washington County Search and Rescue, Hurricane Valley Fire District and EMS, the National Park Service, Utah State Parks and Intermountain Life Flight responded and assisted with each scene. Sand Mountain is hardly a “wilderness area”, so is it time to lobby for a cell tower (relay) near the highest point to provide better coverage? Considering that the folks up in Dammeron Valley have had little luck, so far, shaming Verizon, or AT&T, to provide better coverage, this might be wishful thinking. Most, not all, of the users of Sand Mtn. Recreation Area have paid for a day pass at the gate. This could be a funding source for the infrastructure…. The S&R folks deserve some recognition….Thanks!